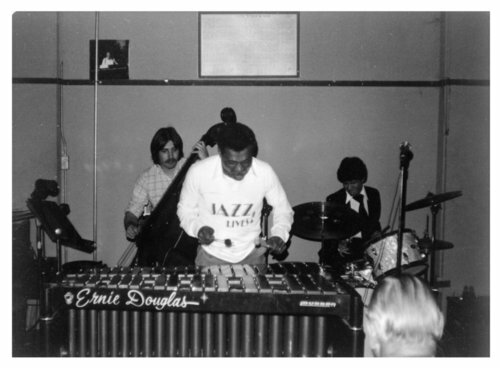 This collection contains photographs of Topeka musician Ernie (Ernest) Douglas, his band, and his restaurant and jazz club, Ernie's Catfish Hollow. Douglas was born November 30, 1932, in Topeka. During the 1950s, Douglas worked as a radio DJ and musician, playing the piano and vibraphone. After a time in Denver, Douglas returned to Topeka where he opened Ernie's Catfish Hollow in 1978 at 1201 E. 6th Street. The restaurant and jazz club closed in 1983. Later Douglas worked for the Postal Service in St. Louis, Missouri, and as a performer on the Dandy Dinner Boat in Alexandria, Virginia. Douglas died in Ellicott City, Maryland on February 15, 2016.